Hwayda Kater is an internet entrepreneur, author, speaker and business trainer. After spending over 20 years in the corporate world helping companies build big brands and sell millions of dollars in products and services, she now focuses her time on providing business and marketing consulting services to select clients from small startups to large marketing departments of leading organizations. Pajama Paydays: How to Make the Internet Work for You by Hwayda Kater is an enlightening read that sheds light on the online job market and how anyone can thrive in it. According to Kater, job security in the corporate sector in the modern world is almost like a mirage. With constant rumors of job cuts, today’s employee is faced with constant anxiety. This volatility has bred a new location-independent market that is growing every day. Pajama Paydays guides the reader while transitioning from the corporate world to the internet-based sphere. Kater tackles topics that may seem daunting to a starter. These include the products/ services that a person can offer, how to market an online-based business and how to use leverage for maximization. If you are just curious or you are seriously considering joining the online market, reading Pajama Paydays by Hwayda Kater will provide you with much needed insight. The book is written in a way that will prove informative to both the starter and anyone who is already established in this market. Kater’s advice is easily comprehensible and applicable. Pajama Paydays also contains a refreshing depth since the book is based on the author’s own journey. The book’s content is dotted by engaging illustrations borrowed from Kater’s experience and observations, which makes it even more thought-provoking. Still, the author is careful to balance the reader’s expectations while instilling hope that transition is possible. I was happy that it was not just another book propagating a get-rich-quick mentality. Definitely worth your time! Pajama Paydays: How to Make the Internet Work for You is a nonfiction Small Business and Entrepreneurship guide written by Hwayda Kater. Kater had already been considering the potential benefits of having her own home-based business when she was laid off from her job as a Creative Director. It hadn’t been her first time being laid off, and this time she was ready to use the opportunity to make her own business happen. In Pajama Paydays, she discusses the different types of income to be made with an online business as well as the different ways to build that income stream. She suggests that readers take a personality test as a first step for custom-planning their home business and provides a link for a test as well as training tools on her website. She discusses the difference between working for others online as opposed to setting up in business for oneself, and shares the pros and cons of each option. She goes into detail about selling products and services online and provides tips on affiliate marketing. She concludes her work with a discussion of the five elements she considers key to success in online businesses, and she offers a 90-day action plan to help readers get started. Hwayda Kater’s nonfiction Small Business and Entrepreneurship guide, Pajama Paydays: How to Make the Internet Work for You, answered a lot of questions I had about building an online business. I was especially interested in passive income streams and drop shipping, and she addressed both of these issues in some detail. I was quite pleased to find that Kater gave me new ideas for online businesses as well as some necessary guidance on how to get started. Her writing style is smooth and conversational, and I often felt as though Kater was personally instructing me on her subject. Kater’s book is appropriate for a wide audience, from those with no internet background to people, like me, who’ve had some experience with working online. Pajama Paydays is a valuable reference work for anyone who would like to grow a home-based business and it’s most highly recommended. This nonfictional work is a must-read for anyone who is considering building an online business, whether it be selling services, selling products, affiliate marketing, or licensing. Or, as the author suggests, a combination of several businesses. In Pajama Paydays: How to Make the Internet Work for You, written by Hwayda Kater, there is essential information for any budding internet entrepreneur. She begins with a pragmatic and insightful exercise – asking the reader to assess his/her personality and skills in five steps. Then, she gives clear, specific instructions on how to build a business (vs. creating a job). It is obvious the author is a successful business owner herself, and she is happy to share her wisdom with anyone who is willing to put in the necessary work to build a full-time or part-time income on the internet. She includes her website link, a bonus video training and a 90-day action plan. The writing style is concise and easy-to-follow. Hwayda Kater has organized each chapter into titled sections, and many of these include bullet-point lists of matters to consider, or things to do. Her tone is one of encouraging hopefulness and honesty; she is direct and realistic. In sharing her own story of how she left the corporate world, and made the decision to work in her pajamas, Hwayda Kater becomes relatable to those who have had their struggles with today’s corporate climate. Author Hwayda Kater has presented a wonderful guide to people committed to developing internet businesses in Pajama Paydays: How to Make the Internet Work for You. 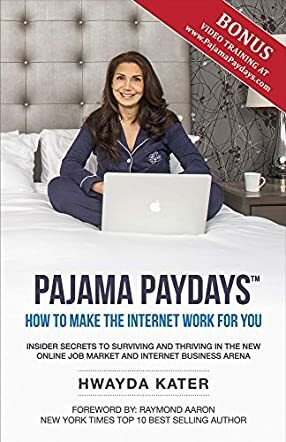 Pajama Paydays: How to Make the Internet Work for You by Hwayda Kater is a great tool for anyone who wants to generate income using the internet. I loved the title of the book, which suggests that one can actually work from the comfort of home, even in pajamas. The big question is how? This book answers that question and offers invaluable information for readers who want to transition from a day job to working anywhere using the internet. Readers will understand the income options that are not so popular, become familiar with the new trends that can boost their success, learn about physical and digital products that can be sold, but above all, they will learn the skills required to move their jobs online and get paid for what they know best. This book also offers marketing strategies to help readers enlarge their reach. The markets are changing and a new mindset is required to meet with the fast changing online business environment. Hwayda Kater offers readers the information they need without being fluffy. One feels that the author is an expert in what she writes and her confidence makes the message even more compelling. If you plan to start an online business, this book should be where to start. If you don’t know what to do but want to consider options for passive income, then this book will be a wonderful guide for you. Pajama Paydays: How to Make the Internet Work for You is compelling, very informative, and loaded with surprising secrets that will help any reader make the breakthrough in online marketing. Pajama Paydays: How to Make the Internet Work for You by Hwayda Kater is a non-fiction book on how to create and grow an online business. In Pajama Paydays, Hwayda discusses primarily four business models that can help to generate three different kinds of income models. What works for one person may not necessarily work for another - depending on personality, lifestyle preferences, life goals, and many other factors. This book is about presenting all of the various options and then letting the reader decide which one may work best for them. Some of the topics covered by chapters are an overview of the changing job market, how to start with transitioning to an online business, selling products or services online, Affiliate or Referral Marketing, Licensing, different types of incomes such as active, passive, and residual, how to bring this all together and customize it for oneself, and more. There are also exercises scattered throughout the book as well as some video training content available for readers. In today’s rapidly changing world of technology and globalization, more and more work and jobs are in the process of transitioning online. In addition to ease of global connectivity, they also offer flexibility in lifestyle and time conservation. So, a book like this is certainly a useful one. Hwayda covers many of the important topics and her engaging, instructive writing style makes this an interesting read. Whether you are an experienced professional or just starting out in your career, this book will definitely help before making the jump to working from home or online. I liked the exercises provided in the book which are definitely useful to increase self-awareness and to know yourself, especially the personality tests. This is a good book that I would recommend.